Nissi Golden Sands is a lovely quiet complex located 500m from Nissi beach. The complex has a mixture of villas & apartments and also has a large communal pool together with a small children's pool. Ayia Napa has something for everyone. There are a huge variety of bars & restaurants within easy walking distance of the complex. The square in Ayia Napa also offers a great night out for those more adventurus. Lovely bright ground floor apartment. This apartment is in a fantastic location, as whilst it is quiet, it is also within walking distance to the local bars & restaurants of Ayia Napa and only 500m from the beautiful Nissi Beach. The apartment has 1 bedroom with twin beds, as well as a sofa bed in the living area. It can comfortably accommodate a maximum of 4 - 3 adults or 2 adults + 2 children. The open plan living area is bright and spacious and provides an ideal setting for relaxing and dinning. There is also a large patio area equipped with outdoor furniture & sun beds. 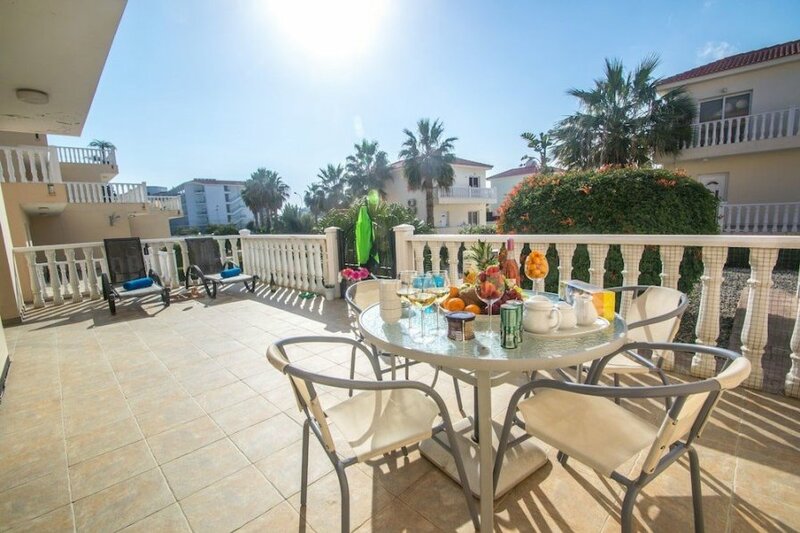 On the large balcony you will find a table & chairs as well as 4 sun beds. This apartment comes highly recommended and is ideal for families and couples alike.